Accepta make laboratory water testing easy. Sample kits can be ordered online safely & securely and the kit will be sent to your address for you to fill and return freepost. Our labs process thousands of water samples for biological & chemical parameters and are recommended by domestic, industrial and commercial customers alike. An important part of running a water system whether domestic or industrial is testing the water for either bacteria, basic chemistry, chemical inhibitor levels or indeed a mixture of the above. Where a water testing laboratory is not readily available much of this can be performed using in-field testing kits utilising reagents, titrants & comparators. Water testing is simplified using a field engineers water test kit to establish results at point of sampling. Our field test kits provide an ideal solution for monitoring industrial and commercial water systems for a variety of parameters. Our web shop stocks dropper reagents/titrants, comparator kits, photometers, Silt Density Index kits and even rapid Legionella test kits. Water systems such as boilers, cooling towers or even large office domestics require chemical treatment or water conditioning to opperate efficiently and safely. 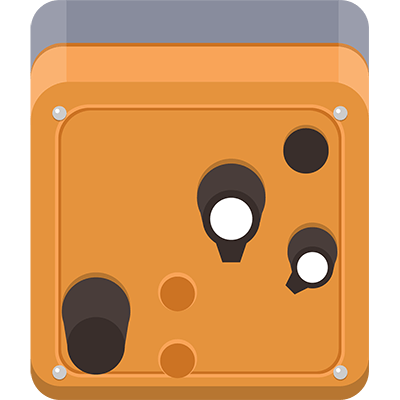 This may be dosing from tank/pot or a more advanced treatment system run by a controller, where water requires conditioning before it can enter the process a water softener or filtration system can be required. As well as this Accepta also manufacturer water treatment plants & dosing systems including Chlorine Dioxide generators, water softeners & cooling tower treatment plants, bespoke to your specification. 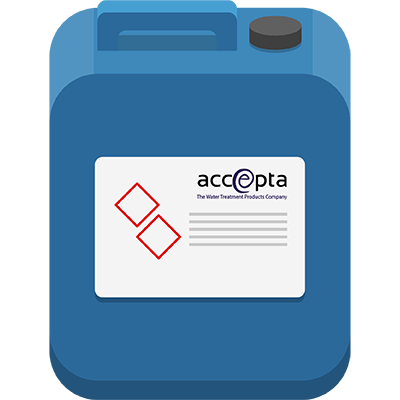 Accepta is the manufacturer and supplier of a comprehensive range of speciality water treatment chemicals, dosage and control equipment, test kits and laboratory services. Our products are used to protect people and assets, save money and maintain the operational efficiency of all kinds of water systems including steam boilers, cooling water systems, closed circuit and HVAC systems, drinking and process water, reverse osmosis and wastewater and effluent systems. Whilst we do offer some niche products directly to end-users our primary market is the water treatment service specialist who benefits from our expertise and highly competitive prices to sell on to their customer either under the Accepta brand or their own label. If you know what you need one of the quickest ways to find it may be to search our website by keyword, this should bring up category pages, guides & products listings. For example “Boiler Sulphite” will bring up a list of Sulphite based chemicals, boiler water testing kits & technical articles on choosing the right boiler control chemicals. 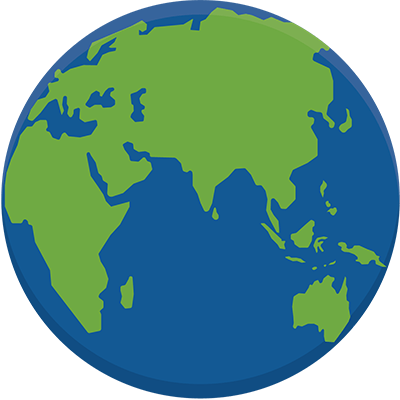 Could you join our list of growing global distributors? Could You Distribute Accepta Products In Your Market? Accepta are seeking motivated distributors in international markets to sell Accepta branded chemicals & equipment. Gain an edge in your market by selling high quality British water treatment products by partnering with one of the UK's leading chemical manufacturers. Our large product catalogue can immediately grow your water treatment offering & our expertise will support you to become a major player in your market. As a manufacturer, our prices are structured so distributors can maximise their profits and grow in their market to our mutual benefit. 'Made in Britain' is recognised around the world as a mark of quality and guarantee you are using a safe & highly effective product. 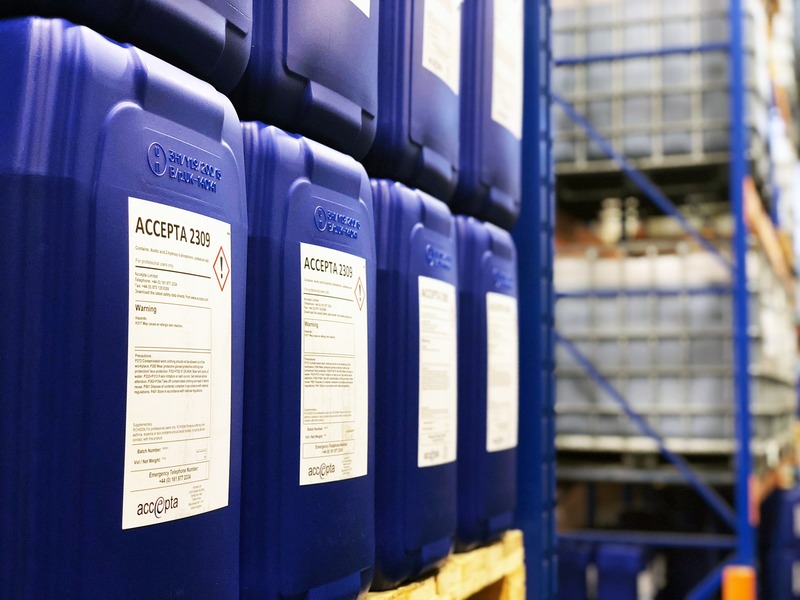 As a chemical manufacturer Accepta have the facilities to supply water treatment companies with their own brand of chemicals either using Accepta's existing chemical blends labelled as your company or by blending your chemical formulas in our ISO9001 accredited manufacturing facilities. 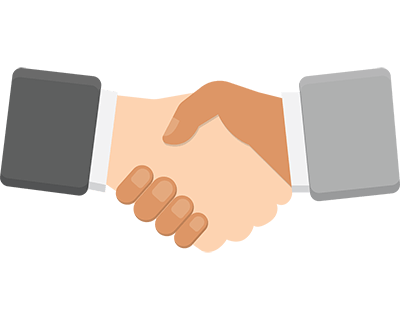 We respect our clients' need for confidentiality and never reveal our involvement to your customers. Chemical transfer from lorry to tank is a benefit many of our customers can't live without, this service is now available to our own label partners as a value-added service for your customers. As an Accepta partner, you will receive access to the guidance of our technical team, manuals & dosage calculators to support you as an effective water treatment service provider. The main component of most water treatment regimes is the use of chemicals to alter the system make-up water in order to inhibit certain behaviours, supplement the water chemistry or simply protect the system & public from unabated bacterial growth. 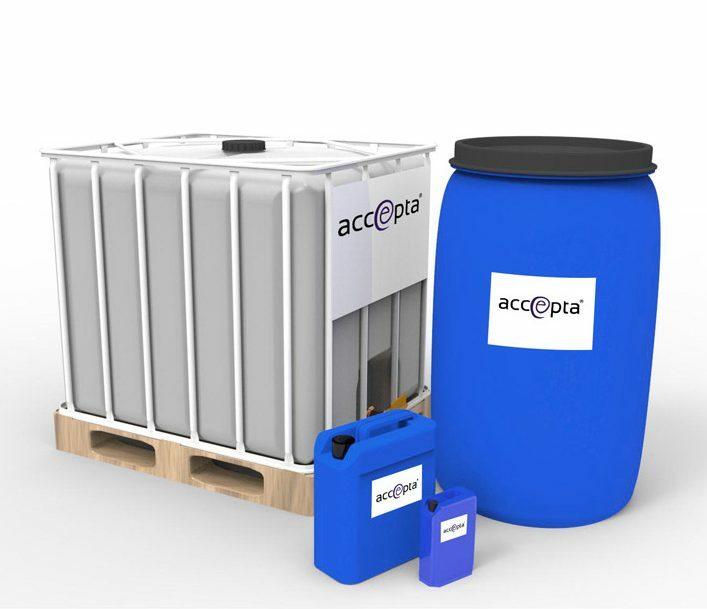 Accepta are suppliers of problem-solving chemicals which provide quality guaranteed treatment which will maintain control over your water system to promote efficiency; saving money, fuel & water, longevity including reduced downtime & lower maintenance costs and safe operation to protect the system, staff & the general public. Industrial boilers and steam generators use significant volumes of fuel, Accepta chemical can help reduce operating costs considerably, to find out more click the button below. 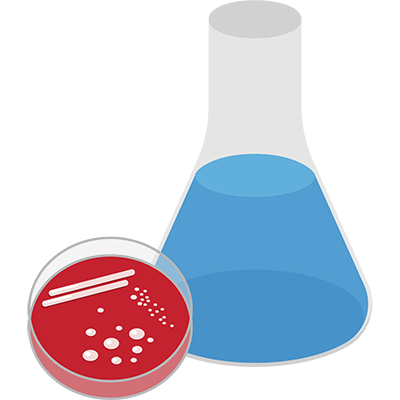 Cooling Towers are a major source of Legionnaires’ outbreaks and as such are prone to extra scrutiny by health & safety authorities, Accepta chemicals are used as part of effective control regimes, to find out more click the button below. Guidance on choosing the most appropriate treatment for your application can be found on the category pages, click the button below to see our range. For our full range of biocidal chemical types as well as guidance click the button below, for additional technical support contact us today. Alternatively to see all chemical categories listed visit our Chemicals page here. 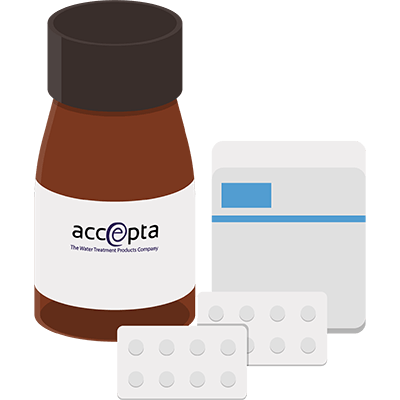 Accepta’s website has a wealth of information and guidance on choosing the most appropriate treatment for your system but if you are still unsure please contact us today for technical advice from one of our experts. Accepta’s innovative, environmentally friendly solid chemicals for water treatment are manufactured in a unique, highly concentrated solid form and utilise proven, cutting-edge chemical technologies to offer several significant operational, safety and environmental benefits over comparative liquid water treatment chemicals. Accepta’s range of high performance drop test kits allow the quick and accurate in-field analysis of an extensive range of common parameters to suit most analysis requirements. Chlorine dioxide (ClO2) is a highly potent, fast acting bactericide and virucide that is effective at concentrations as low as 0.1 ppm. The Accepta Chlorine Dioxide dosing system produces ClO2 instantly by means of a safe, highly efficient and simple reaction.